I have actually had quite a hard time writing this review, not because I didn’t like it. I loved this film, very much. But I have found it quite difficult to get my feelings out, and I thought I would wait for a second viewing to do so. Last night I watched Milk for the second time, and I finally feel like I can get this all out. I am sure you all know what this film is about, it won two Oscars. It is about a man named Harvey Milk who was the first openly gay man to be voted into public office in America. The film tells the story of his life after he moves to San Francisco and leads up to his death. I find it rather surprising a film hasn’t already been made about Harvey Milk (Documentary, yes), the story is interesting and it contains some very important themes. But this film has been made at the right time, so I guess it is almost a good thing. Watching this film, I had to wonder, how far have we really come since the 70’s in relation to the subject matter? In some ways it feels like a lot and in others not so much. And why? Is it fear? Probably, fear of change, fear of moving forward, fear of the unknown. Harvey seemed like a very passionate man, he wanted to bring about change. Change for the better, and he fought for it until the very end. You see a person like that, and he really had the guts to go and do what he was passionate about. He was very aware of the risks, and he still went out and did something, to make a difference. That is something I really admire. This film really does show what he went through, the tough times he faced, the backlash of what he was trying to do. It is a very passionate script, and the film works and survives because of that. This script won an Oscar and I can really see why. The direction by Gus Van Sant is quite fantastic, he got top performances from his actors. The visuals are stunning, there are some scenes which really work well, spliced with actual footage. Gus is an interesting film maker, and he has made very different types of films through out his career touching on all sorts of subjects. He tackled this project, and the end results is truly excellent. It is an important film, even more important today, around thirty years after Harveys death. The performances are simply amazing, Sean Penn is the only choice for this role. 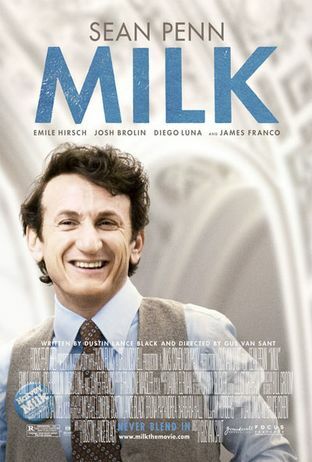 As he has shown in the past he is a strong actor, and with this role Sean Penn disappears and Harvey Milk appears. He embodied the character, and he did not let up. He even resembles Harvey phyiscally, he went all out here, and its no wonder he won an Oscar. Josh Brolin who has been on quite a roll lately, was just excellent as Dan White. He looks so much like the real Dan White, and brought everything in for this role. Not an easy role to play but Josh did it. The other players like James Franco and Emilie Hirsch are also simply amazing, they have great chemistry with Sean, and everything meshed quite well. Emilie was way too adorable I have to add. Diego Luna was on and off for me, he had chemistry with Sean, that wasn’t a problem. Something was just slightly off at times, but he was more on then off. His role also wasn’t an easy one and I do think Diego struggled at times. I would say this is a must see film, it isn’t at all what some people might think. It is an important film, beautifully crafted. Wow, great review, Marcey. I missed it when it went through the cinemas, but am definitely going to chase it up now…..just need to get through the DVDs that Daniel's given us – they're still sitting there because we've been working our way through the entire series of Frasier (eleven!) and we're only up to season eight! Why thank you! I've been getting some positive feedback on it 🙂 You have to check it out, its just beautiful.Yeah I have alot of other DVDs to watch too. Wow all 11 seasons of Fraiser!!! Good luck! !